I’m back with the winner from our March Birthday challenge! Thank you for sharing your talent with us this month! We loved looking at your birthday projects. The winner of the YNS stamp pack is… #26 Crystal D.!! Please email lora at onecrazystamper dot com to claim your prize. 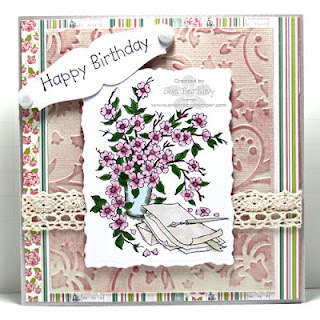 And I have a couple cards to show you from our March guest designer Aaemie! 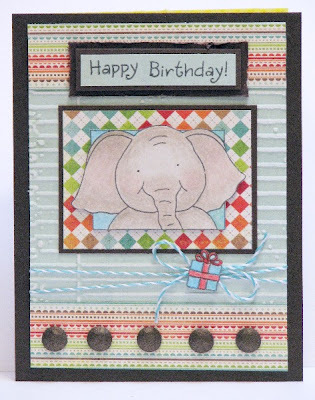 Be sure to check out Aaemie’s blog for more details on her cards. And check back tomorrow for a new challenge at OCS!!! I have a product spotlight: Ranger Stickles, which come in a multitude of colors from One Crazy Stamper . 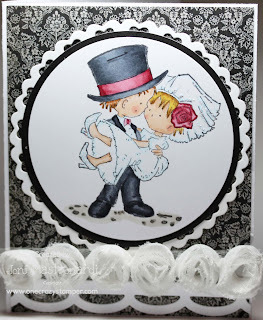 I stamped the adorable Don & Daisy Just Married stamp with Memento Tuxedo black ink unto Xpress It cardstock and colored the image with copics: C10, C8, C6, C4, R89, R85, E11, E000, E35, Y11, Y21, B00. I cut out the focal image with a circle nestie and layered it with black and then the heart circle nestie. DP is Basic Grey Little Black Dress. Below is a close up to see the Ranger glitter added to her veil and shoes. Hi all, another Wonderful Wednesday – and it is almost APRIL – which means you only have a couple of more days to enter the March Birthday Challenge at OCS. to color the other ones I have not inked up yet. SIGH – another time. My card measures 5” x 5 1/2”. I started with stamping “Wee Florist” onto Xpress Blend It Cardstock with Memento Tuxedo Black Ink and colored with Copic markers (too many to remember unfortunately). The image was die cut with Spellbinders Labels 23, and instead of cutting a mat, I simply ran a black Sharpie around the edge to create the illusion of a very thin mat. Papers are from Basic Grey and SU. An MS border punch was used to create the lacy look down the sides. Ribbon and flowers can be found in the embellishment dept. at OCS. Take time to “Stamp up a storm and ink up a wish” and send it on to someone special. 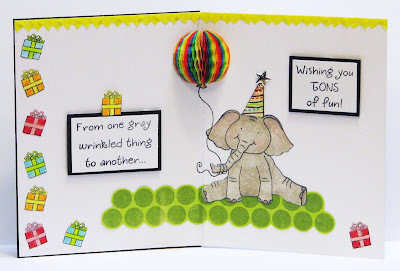 You still have a few days left to enter your card in this months challenge here at One Crazy Stamper, and the theme for this month is Birthdays! 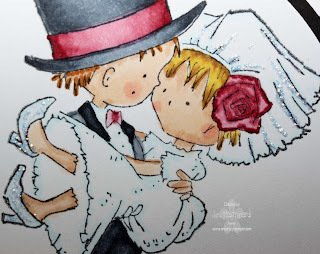 Brand new, both online and in store, are the Art Impressions stamps, and I have been eagerly waiting to show you one of the cute images made into a card! This is Party Girls - stamped with Memento Tuxedo Black ink on Copic Xpress It cardstock and colored with Copics. I added small bits of sparkle confetti with a Sakura Gelly Roll Clear Star pen. The dp, ribbon and sentiment are all from my stash of supplies. Wishing everyone a day filled with as much happiness and fun that these ladies are enjoying!!! For my One Crazy Stamper post I am sharing another Inky Antics Honey Pop creation. This time I used the Birthday Elephant Honey Pop set and a rainbow Honeycomb paper pad. 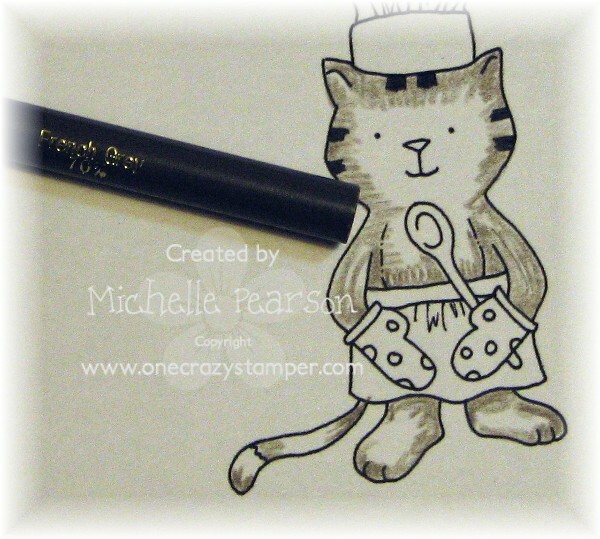 If you missed my tutorial on the coloring or assembling of these fun cards, please see last week's post. You can decorate the inside of your card as much as you wish. 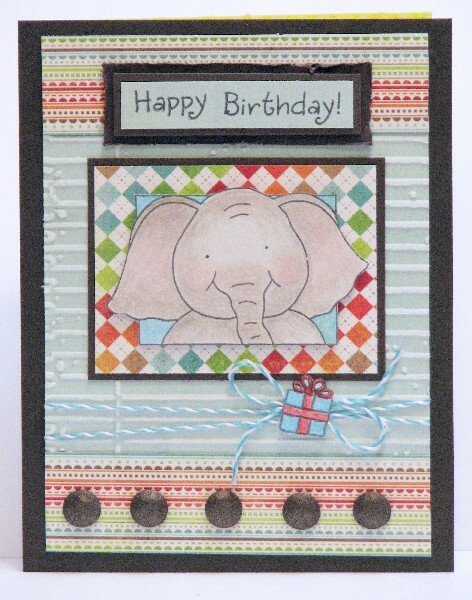 I cut out some circles from designer paper to ground my elephant...and was sure to add plenty of present accents. Be sure to check often to see what sales Lora is offering....she has a great variety of items and is always adding goodies to the store! 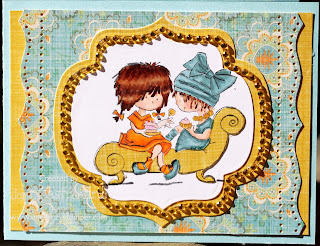 From the Desk of and Spellbinders Bossabilities Product Review. Hi All! 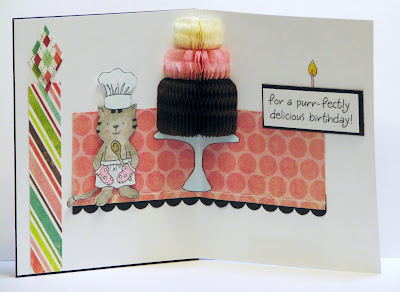 For my last birthday card for this month,I have used the stamp From the Desk of by Flourishes and a new Spellbinders product called the M- Bossabilities Embossing Folder. 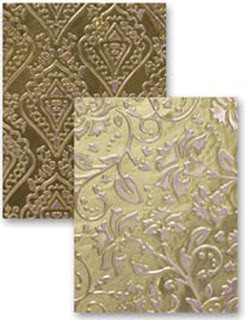 These new M-Bossabilities Embossing Folders from Spellbinders are amazing. As each folder has two detailed designs they are reversible and therefore more versatile. They only need to be run through the Cuttlebug once and the recipe is Plate A, cardstock inside the folder, 3 pieces of cardstock as a shim, then plate C (these are the instrustions from Spellbinders). I did it twice; the first time with the shim, and the second time without the shim and achieved the exact same results. 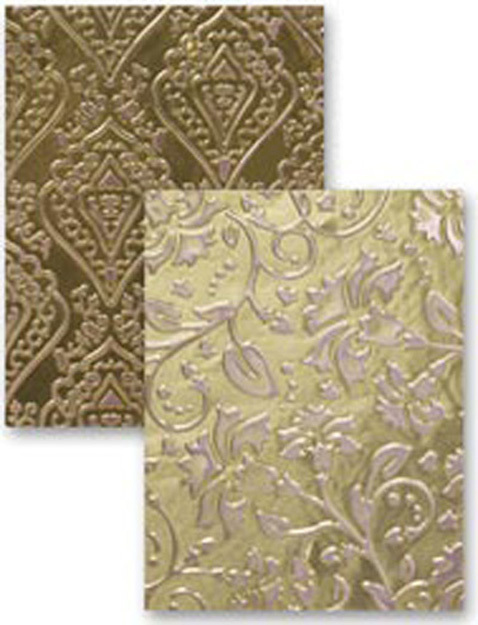 It is certainly well worth the money as you get two embossing folders for the price of one. For the above card I trimmed it down to size and then distressed it using the Victorian Velvet Distress Ink. You still have time to enter this month's challenge which is "Birthday Wishes". Hi All! I have a fun product focus for you today! 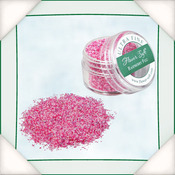 One of my favorite products: Flower Soft! I am going to show you a cute trick with this super fun product! First stamp your image. If I am coloring with copics I ALWAYS use Memento Black. I also always cut the paper into quarters so I have room for whatever I decide to do with the image. Then color the image with whatever colors you look. Here are the copics I used for this image. I used the large circle nesties to cut out my image. I emboss the image and then I sponge around the edge. Using a pencil I draw in a line for a border for the flower soft. I decided to use Raspberry fizz ultra fine because i loved the color! If you want more of a shag then use regular flower soft. Also the ONLY adhesive I use with flower soft is the flower soft adhesive because it comes out white and can be easily manipulated with your finger and it dries clear. I use the pencil to break some up in the lid. it is easier to sprinkle on that way. Once I sprinkle it on I push it into the glue and try to fill any holes that may appear. This is Kraftin Kimmie's Betty on her shag rug. Finish up you card and you are finished! I used Lacy circles nesties to compliment the embossed circle nesties. Hope you liked the fun tutorial. Have a great week! And you still have time to enter our birthday challenge! 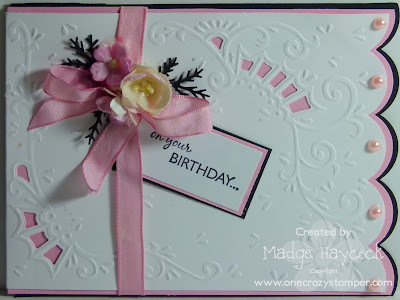 We are still having our Happy Birthday Challenge at One Crazy Stamper. There is still time to join in the fun for a chance to win a free stamp! 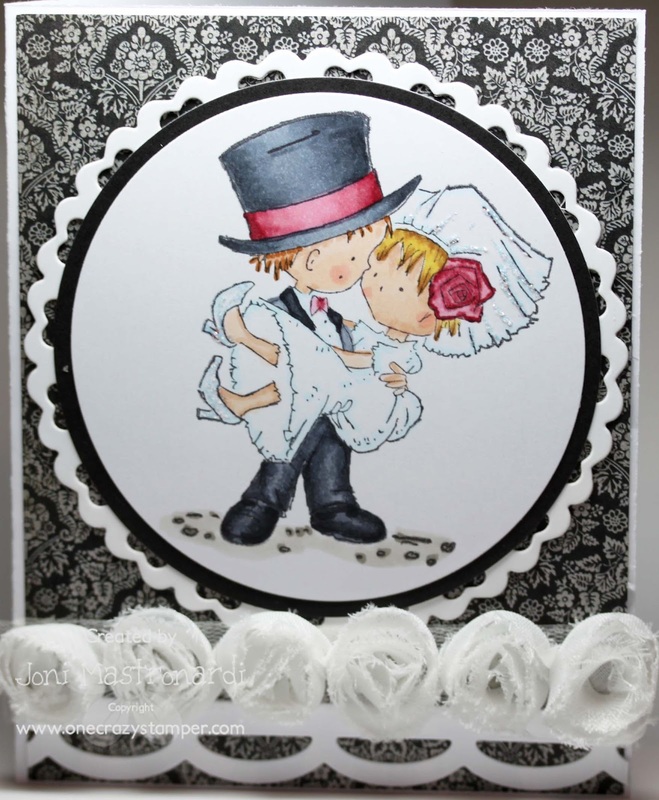 Today I have this adorable Don and Daisy stamp available at One Crazy Stamper. I cut my image with a nestie and trimmed it with rhinestones. DP is from my stash. 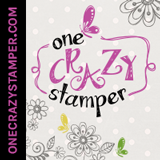 Hi everyone Cindy here, I’m so thrilled to share a One Crazy Stamper card with you all today. 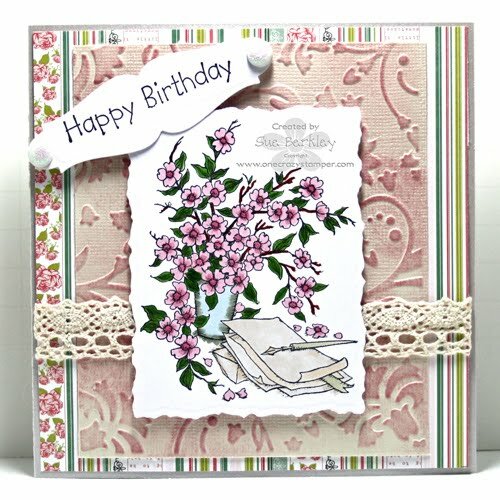 I have used the SWEET stamp from Belles N Whistles (Picnic Solace). Hi all, Well Spring is supposedly here – right? Here in Vernon, it’s windy and cold, snowing at night and melting by 9 a.m. Weird! I’m showcasing some new items that I have purchased from my absolutely favorite on-line store…OCS . Lora has so many toys and pretties to chose from!! I’ve made this card for a friend, who has made it quite clear that she doesn’t like colored images on cards . . . . . dead silence?? Well, she’s a wonderful friend and I love her just the same. 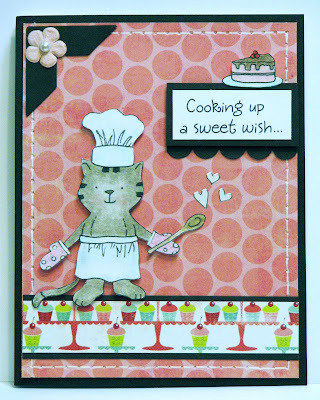 My card is a clean and simple but I got to use a whole bunch of fun elements. Run 6” part through the beautiful Marianne Designable – Vintage die then I Scallop embossed the edge with the Large Scallop die from the Spellbinders Classic Edges 1. Adhere Pink behind front white and black behind inside white flap. Make sure to keep the edges equal. Tie pink ribbon around card and tie into a bow. Tuck sentiment and black fern punchies under knot of bow. Add flowers of your choice – Lora has such a beautiful selection here. I like to make my flowers sturdy for mailing by using Diamond Glaze – it also adds a bit of irridescent gloss. I stamped the inside of my card with Tsukineko Jet Black StazOn with a beautiful flourish stamp called Lavish Flourishes by Whimsy stamps. A row of white half pearls (which I colored pink with copic marker R81) was added to the scallops on the front. I’ve used a lot of different products from the OCS store. Hope you like it. “Stamp up a storm, ink up a wish” and send it on to someone you love. PS. You’ve still got time to participate in the March Challenge at OCS!! There are Prizes to be won!! See you at your blog! 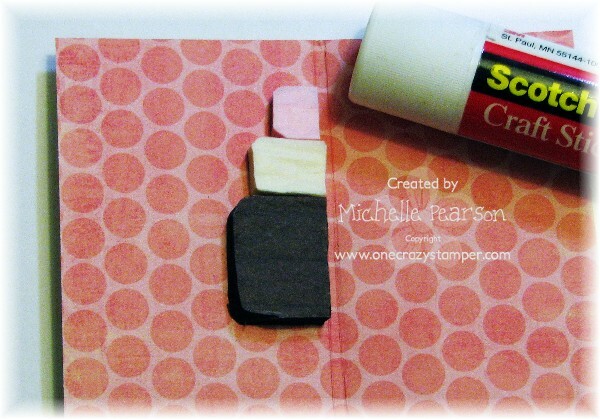 Welcome to my first ever tutorial for One Crazy Stamper!! This is going to be a long post, so grab a cup of coffee or tea, sit back, relax, and learn how to do the fabulous burnished velvet technique with micro fine glitter, that I have used for the front of my card!! 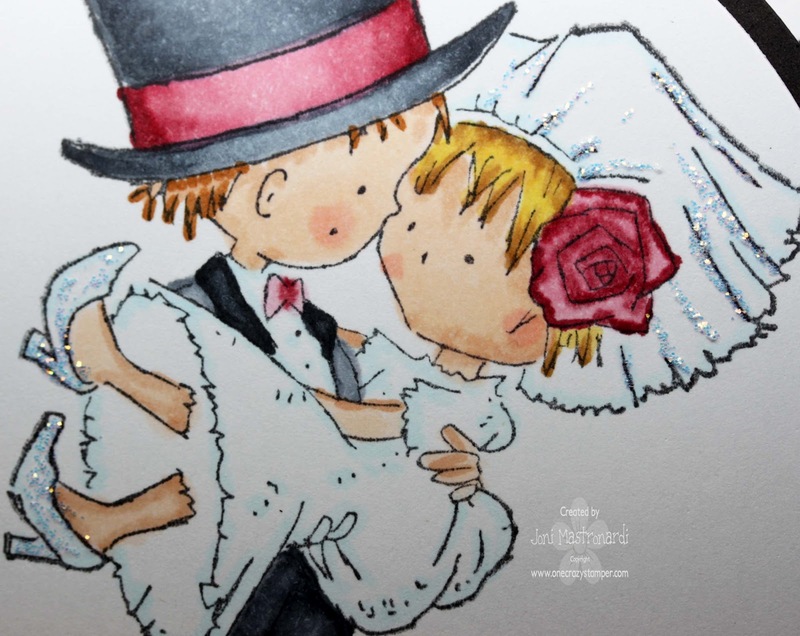 The image and sentiment are from Kraftin' Kimmie Stamps "Alice in Wonderland" stamp, colored with Copics then fussy cut, and popped up on the glittered card front. You will need the following items to get started - paper of your choice for the front of your card, Glitter Ritz ( I used Canadian Blue, Sky Blue, Purple, Rose, Grasshopper, and Silver ) in the colors of your choice, Scor Tape, large makeup brush, punches, fine tip tweezers, glitter clean up cloth, saved Scor tape white cover paper, and scissors. ﻿Adhere the Scor Tape to the paper that will be the front of your card by removing the brown backing paper from the tape. Remove the white cover paper and save for later use. Do not touch the sticky tape with your fingers, as the oil from your hands will affect the adhesive and may cause the finished glitter to appear blotchy. Using saved pieces of the white cover paper from the Scor Tape, punch out any shapes that you want to use, and then using the tweezers carefully apply these shapes to the front of the card. Make sure to rub the punched pieces down on to the exposed sticky tape to prevent the glitter from adhering under the punches. You must use the saved pieces of the white cover paper as any other product will not release from the sticky tape. Again using saved Scor Tape pieces, cut out the center where you do not want the glitter, and adhere over the sticky tape. Pour the first color of glitter over the sticky tape, this will be the main color of your card front. Using your fingers rub (burnish) the glitter into the sticky tape until the entire card front is covered. Remove the excess glitter by shaking it off and using the make up brush. Carefully peel off the large piece of Scor Tape cover paper, cut it into strips, and then replace some of those strips, apply different glitter colors using the same method as above. Repeat until the card front is totally covered. 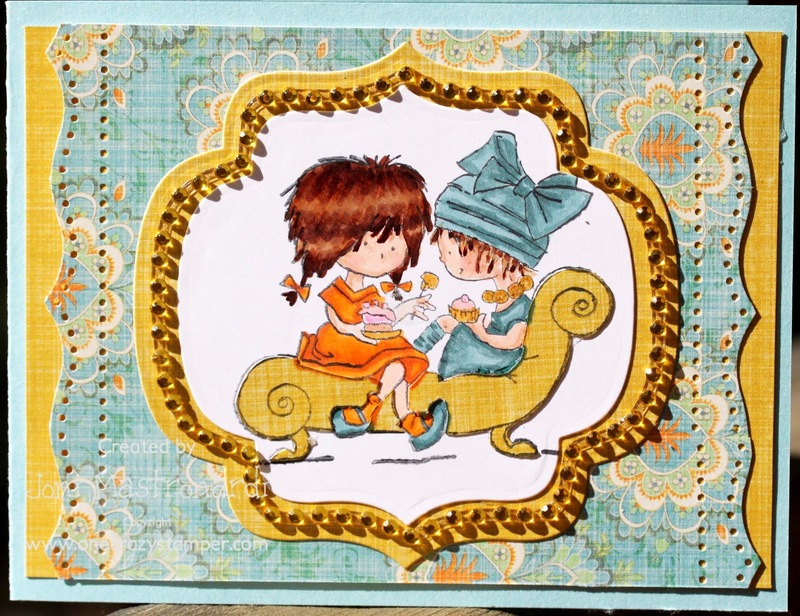 To finish the card front, remove the punched shapes with tweezers, cover with the last color of glitter, burnish, shake off excess, and surprise - you have completed a beautiful burnished card front!! I hope that you enjoyed this tutorial, and that you will try out this stunning technique as I know that you will love the finished project!! You still have 10 days to enter the monthly challenge at One Crazy Stamper to win a fabulous prize, so get creative, and play with us! 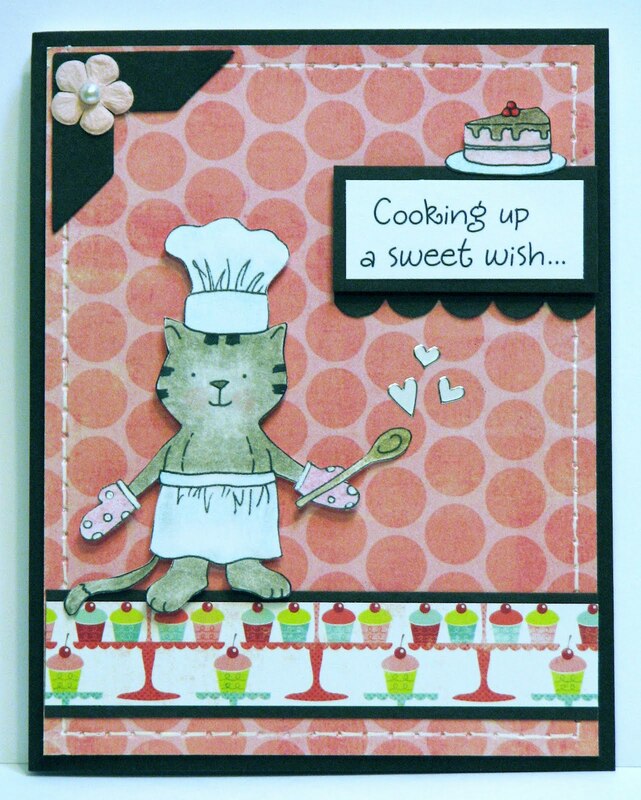 Today I'm sharing a card using Inky Antic's Baking Kitty HoneyPOP set. I have a double tutorial for you...first how to color using PrismaColor Pencils and Gamsol, the Inky Antics way....and then a tutorial on how to assemble the HoneyPOP portion of the card. You will want to use regular color pencils for this technique, not watercolor pencils. You apply color to your image lightly where you want the most pigment. 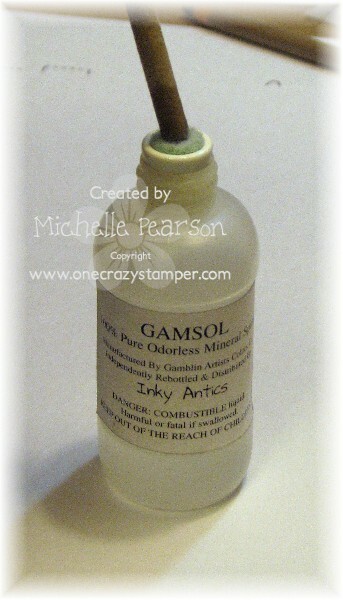 Next, you will apply Gamsol (a brand of artist grade odorless mineral spirits) with paper stumps to blend your image. This is effectively *melting* the wax of your pencil and smooths out pencil lines. If your stump begins to drag or squeak, just rewet with more of the mineral spirits. You can sharpen/clean your stumps on an emery board or sand paper. Personally, I use one stump per color and don't bother with the cleaning or sharpening. Now for the fun 3D HoneyPOP element on this card! 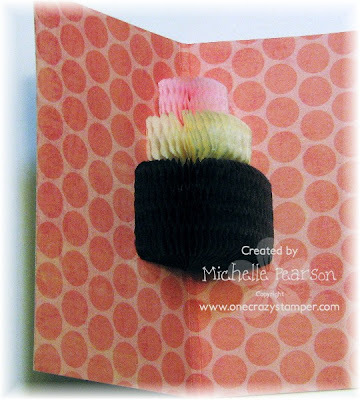 You will simply stamp the cake pieces on the desired colored HoneyPOP paper pads. One hint here is to use a similar colored ink, this makes it less noticable if you leave a hint of the stamped image when cutting your pieces out. You will want to create a 1/8 - 1/4 channel down the center of your card, rather than the traditional center fold. This will allow for the honeypop element's thickness when the card is closed. I am really unscientific about this....I use a Scor-Pal and just scoot my card over a titch to the right and score on the 4 1/4 inch mark and then flip my card and repeat; scooting my card over a titch and scoring again on the 4 1/4 inch mark. This gives you two score lines, one on each side of center. When it comes time to add your element to the inside of your card, you will simply cover one half with a glue stick and position just to the outer edge of your score line. Your honeypop piece will fit into the *spine* you've created in your card. Add glue stick to the top of the honeyPOP piece and carefully close your card. 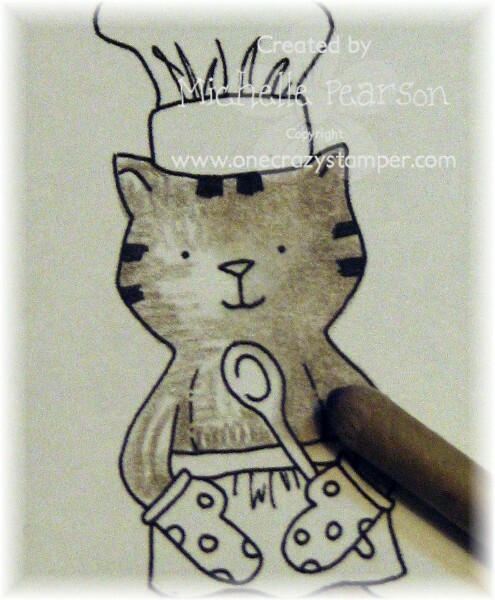 The next time you open your card you will see your HoneyPOP magic! I like to dress up the interior of my cards, but if that is not your thing....a simple stamped sentiment and HoneyPOP element will still bring a smile! March Guest Designers Leanne & Aaemie!! March OCS Challenge "Birthday Wishes"